Barra: GM still has confidence in China. DETROIT -- General Motors' second-quarter results offered a sigh of relief -- at least temporarily -- to investors and other market watchers worried about slowing growth in China. GM shares leapt 4 percent on July 23 after GM said its pretax income and profit margin in China rose in the quarter. Income from GM's joint ventures in China rose 6 percent to $503 million, and its profit margin improved to 10.2 percent from 10 percent a year earlier. The improvement came despite a recent slowdown in demand and worrying signs about China's economy, including a swooning stock market. The China Association of Automobile Manufacturers has cut its forecast for vehicle sales growth this year to 3 from 7 percent. GM CFO Chuck Stevens said GM has been able to offset slowing demand and price pressure in China with a better mix of more-profitable vehicles, such as Cadillacs and SUVs, including the recently launched Buick Envision midsize crossover. He acknowledged, though, that sales growth has been slower than the 6 to 8 percent that GM had been expecting for the year, easing to about 1 percent, he said. And pricing has been weaker than the 3 percent drop that GM projected at the start of the year. 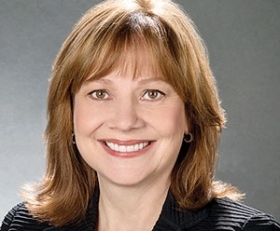 CEO Mary Barra said the recent slowdown hasn't shaken GM's confidence in China's long-term growth potential. GM and other automakers are focused on the booming megacities in the country's interior, shifting emphasis from more-mature coastal markets. She said GM still believes China has the potential for 35 million annual vehicle sales within 10 to 15 years, up from around 20 million last year. "We recognize that China is a big concern," Barra said. But she said, "We are well-positioned right now in that market and we want to continue to be well-positioned to capitalize on that growth." Overall, GM's pretax profit excluding one-time items -- the figure the company says is most reflective of its underlying performance -- more than doubled to $2.87 billion, from $1.35 billion a year earlier. Higher sales of profitable pickups and SUVs were the biggest contributor.